40 Million Credit Cards — VII. A first man, presumably clean-shaven, and a second man, who apparently has a beard, sit at a round table. On the table can be seen a microphone and a loudspeaker. First man: Our guest, Mr. Bruce Schneier, says credit cards ought to use public-key cryptography. Second man: Then nobody could charge your card without your permission. First man: An industry representative is on the line with us. Voice from loudspeaker: We've been using public-key encryption for years. Voice from loudspeaker: Your credit card number is your public key. You must disclose it when you use it. Second man: Nonsense! If credit card numbers are public keys, then why would anybody steal 40 million of them? Voice from loudspeaker: That's the beauty of it. Voice from loudspeaker: It does double duty. 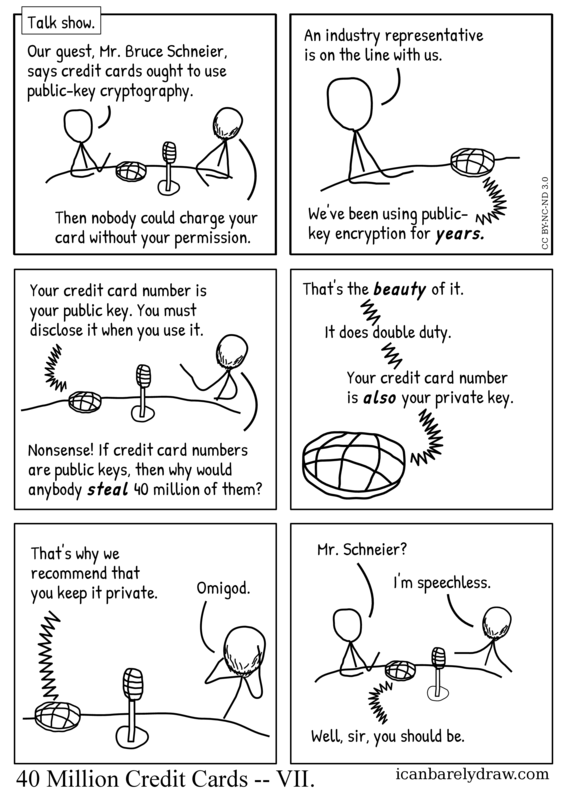 Voice from loudspeaker: Your credit card number is also your private key. Voice from loudspeaker: That's why we recommend that you keep it private. The second man is seen clutching at his head with both hands. Voice from loudspeaker: Well, sir, you should be. Title: 40 Million Credit Cards -- VII.